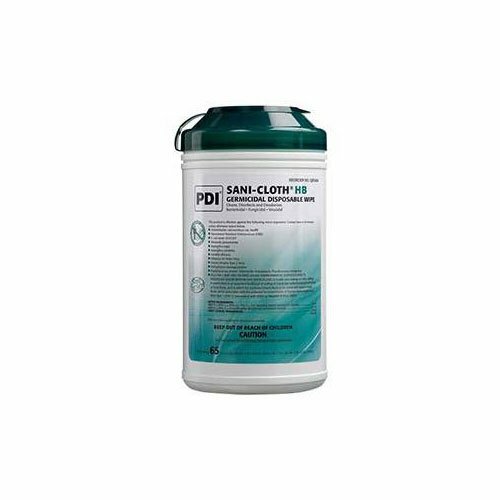 Sani-Cloth HB Germicidal Disposable Large Wipes is an ideal product choice when needing to thoroughly and quickly clean areas that have been exposed to a wide range of micro-organisms. This product is highly effective, easy to use, and come in handy canisters or individually wrapped packets. Sani-Cloth HB Wipes are compatible with a broad range of surfaces and equipment in healthcare. These wipes are designed to accommodate hard, nonporous environmental surfaces found in healthcare settings. Sani-Cloth is effective against 100 microorganisms in 10 minutes. Accessibility: Deep well, lid provides ample space to store and access the next wipe. Compliance: Prominent contact time for easy identification and improved compliance with accreditation standards. Identification: Categorization of pathogens allows for quicker identification of relevant efficacy claims. Safety: Icon clearly communicates the key safety information on both label and lid. Premoistened and ready to use. Compatible with a variety of surfaces and equipment in healthcare. Meets ODC, OSHA, AHE and CMS Tag F441 guidelines. Contains 160 Sani-Cloth HB Germicidal Disposable Wipes - Large. May be used on hard, non-porous surfaces of bed railings, glucose meters, cabinets, carts, chairs, counters, dental unit, instruments trays, exam tables, gurneys, isolettes, IV poles, stethoscopes, stretchers, tables, telephones, toilet seats, diagnostic equipment, patient monitoring equipment, patient support and delivery equipment and many more! Note: Please refer to product packaging for the most up-to-date information.